Selecting the right tent is an obvious starting point; the marketplace is packed with options and making the right choice is tough. 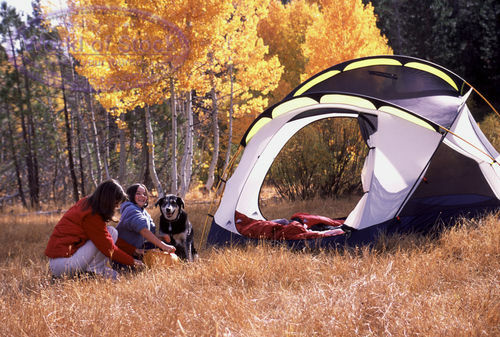 Vango are one of the most well-known brands and offer high quality camping tents. They cater for individual designs through to large family tents and can offer strong weatherproof material and reliability under heavy use. The Vango range extends from the ‘Dart 200’designed for 2 people through to their dramatic ‘Maritsa 700’ housing up to 7 people with additional living space. You can see a demonstration of how easy it is to pitch the Dart 200 tents here and see features of the Maritsa 700 here. Also considered a top tent producing brand is Outwell. They also offer durable tent solutions in a variety of sizes and are a trusted designer across the world. Perhaps best known for their ability to add varying attachments to their tents they can form extravagant designs perfect for holiday camping and group events. Other brands to consider include Kampa, Coleman, Khyam and Sunncamp. Each offer their unique takes on tent designs but generally all cover the same needs of campers at differing price ranges. Selecting the right footwear and clothing for camping is an important choice. There is really no right or wrong answers as long the brand offer sufficient weatherproof protection and warmth. Berghaus are regarded as a premier supplier of outdoor clothing that is tested under extreme freezing conditions – for example, during expeditions to Antarctica! North Face is of a similar nature; offering warm camping clothing such as fleeces and walking boots. The other major producers are Meindl and Deuter. Quality walking boots are also made by mainstream suppliers such as Rockport; decide the type of terrain that you will encounter for the best foot support option. All of the above brands produce quality backpacks and duffle bags designed for outdoor use with individually tailored extras. It is often advisable to speak to a professional to ensure you are selecting the best for your trip. Take a look at a quick hints and tips/buying guide to make sure you’re on the right track. Finally think carefully about the likely outdoor temperatures to ensure the best sleeping bag is considered. Most of these recommended brands are readily available at country wide retailers like Cotswold Outdoor and Yeomans Outdoor. There are a number of things to consider when deciding on camping products, review prices, quality and comfort in order to make the correct purchases. When you do setup camp, don’t be let down by your purchases and ensure a great experience for all.